I had another checkup with the doctor the other day. It was my 8 week mark. Four weeks earlier, I had been instructed to stay in the boot for 4 more weeks. As I wrote in my last post, I disobeyed that order one week early and started wearing 2 shoes. He was happy with my progress and was fine with me “listening” to my body. Looking at my leg he was concerned that I still have a lot of swelling. This picture is a little worse than normal. I had been standing on it for a while. But even when I wake up in the morning, my leg is swollen a bit. The doctor was concerned that I might have a blood clot. Although a low probability, the consequences could be severe. (death) So, he sent me in for a vascular ultrasound right away. Fortunately, the scan was clear. My blood flow is very good and no blockages were detected. It has been 7 weeks since my surgery. I’ve been in the boot for the last 3 weeks. My flexibility and tendon strength has improved. At my last visit with the doctor, he told me to wear the boot for a month. After being in it for 3 weeks, I think it’s useless. As long as I’m careful not to re-rupture it (no football I am fine. I have a slight limp. It feels weird to flex the calf muscle. I can feel the tendon move up and down. It’s so nice to be back in shoes and I don’t need to do any more left foot driving. My next appointment is this Friday. I suppose the next step will be physical therapy. I don’t have much to report this week other than to show my latest picture and video. The foot is still swollen. I’ve had gradual increase in motion range. There’s redness at the incision, but no puss or leakage. I don’t think that there’s infection. I’m still wearing the boot, but I take it off for sleeping and showering. I took out the wedge. So, I’m now walking with the foot at 90 degrees. I’m supposed to get the boot off in 2 weeks, then I start physical therapy. 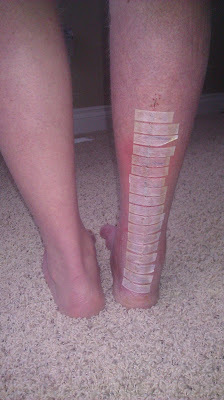 It has been 4 weeks since surgery on my Achilles tendon. I’ve been in a cast for the last 2 weeks and it has gone well. 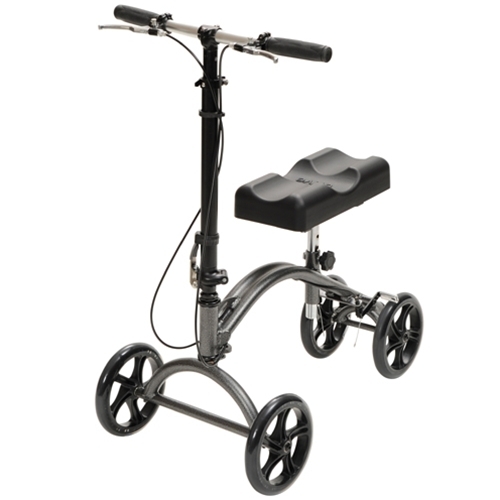 The knee scooter has been a lifesaver and is actually fun to use wherever I go. 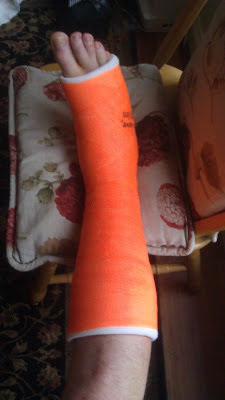 The bright orange cast had the intended effect. Nobody missed it. So many people have stopped and asked me what happened. I seriously wish I had printed out a pamphlet to hand out. I have had to tell the story of my ATR dozens of times. Sometimes it’s a bother, but most of the time I enjoy making people cringe. I try to make it an educational moment and advise people to stretch before intense exercise. I have been very blessed. I still have had no pain or discomfort. I have been walking on it more and more…even in the cast. I haven’t had any falls, but there have been a few close calls. At my 4 week checkup, they removed my cast, checked the incision and range of motion, and put me in a boot. I came prepared with an extra sock and I brought the boot I used before surgery. The whole visit lasted about 10 minutes. The doctor was going to instruct me to only put partial weight bearing (PWB) on it, but when I told him that I was already walking without pain, he was okay with me using full weight bearing (FWB) in the boot. I can take it off for bathing and sleeping, but other than that, it needs to be on all the time. My next checkup is in a month. I took a shower when I got home and it was nice to clean up my nasty leg. The skin was all flaky and blotchy. After cleaning it up, it looks much better. My foot is still swollen and it still gets a little purple after long periods of standing. I was also instructed to do range of motion exercises and stretches, but nothing intense. Here’s a video of where I’m at today. It was 2 weeks from my surgery yesterday and I had my first post operation check-up. The splint was removed, stitches were taken out, and I got a cast. I was really anxious to see the stitches. From what the surgeon told me, it sounded like the operation would require a long incision. I was right. I was amazed to see how long it is. It’s about 12" long! I’m curious to know if any other ATR veterans have ever seen a longer incision. This must be some kind of record! I wish I had taken a picture right away, but she put the little tape strips on before I had a chance. I still have some swelling and the skin feels a little numb. I don’t have as much movement in my ankle as I thought, but at least I’m able to place my foot nearly at 90 degrees from my leg. The doctor verified that all looks good. There are no signs of infection. He then took me over to get a cast. I’ve never had a cast before. I had about 8 colors to choose from. Being a Florida Gator fan, I chose neon orange! I don’t want anyone to miss my cast. While the nurse was putting the cast on, I made sure to minimize my foot-leg angle as much as possible. I would estimate that I have it at about 95 degrees. I was pretty faithful in doing my stretches since the surgery. So, I think this is pretty good. Astute observers will notice something unusual about my toes. That is not an illusion. My second and third toes really are joined together. I haven’t had much opportunity to show off my webbed feet. Everyone will get to see them now. I will be in this cast for 2 weeks, then they will evaluate whether I should be in a walking boot, or another cast. Even though, this is a non-walking cast, I’m able to walk around a bit in it. 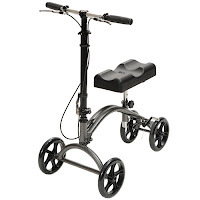 I will do so for short distances, but will use the knee scooter for wood floors and when walking far. I remembered to get a handicapped permit. I’m happy to be able to get the good parking spots for the next 3 months! For a brief update on my previous post…all my digestive problems are resolved now. Stopping the Oxycodone was all I needed to be back to normal. Using crutches for five days was no fun. My underarms were sore…not from pressure from the crutches, but more due to the fact that I was using muscles that don’t get used very much. I would get sharp pains whenever I moved my arms in a certain way. I am not a sedentary person. I exercise 3 days a week, which includes bench presses and push-ups. But I guess my exercise regimen never uses those “crutch muscles”. By day 5 after surgery, my top priority was to find a knee scooter. I researched my options and will briefly explain my choice. 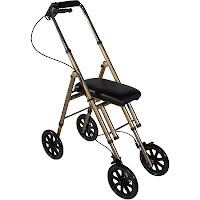 There are basically two types of knee scooters: steerable and unsteerable. And there are two ways to obtain one: rent or buy. Non-steerable scooters cost less, (~$170) but, as the name suggests, are not very maneuverable. If you need to turn, you have to stop, pick the front wheels up a bit, and move it over. Steerable scooters are more expensive, (~$200) and have the ability to move around much better. The non-steerable type seemed less convenient and actually more dangerous. If I have to keep picking it up to change direction, that increases my chances of falling. The price difference is small, so I picked the steerable kind. I saw rental rates of $35/week or $100/month. I think I’ll need it for 1 to 2 months. My insurance would cover it at 80%, so I’m looking at $20-$40. For buying, I saw many online vendors, but delivery takes about a week. I wanted one ASAP. I did a search on Craigslist and found one, brand new, for $250. It was only a 15 minute drive away. I decided to buy it, and when I’m done, sell it back on Craigslist or eBay. I figure I could sell it for at least $200. I’m sure that if I bought or rented through insurance I could probably save a few bucks, but I couldn’t stand to use those crutches any more. I used my HSA account to pay for it. So, I bought it with pre-tax dollars. I’ve been using it for a couple of days now and I love it. It is a little hard to use in tight spaces, like around the house. Having something to prop my knee up on is great. I can use it to do standing tasks. My family is very happy that I can resume my normal role as dish washer. I went to the mall and theater yesterday (Les Mis is awesome!) and it was nice to glide around, but I discovered that it’s not totally worry free. The wheels are small and the steering wheel turns easily. So, when hitting bumps or dips, the handlebars can quickly turn, and if I’m not paying attention I could end up on my arse or worse. The brakes work, but the wheels have no grip. So, going down a hill is a scary experience. The most important thing is that this knee scooter will enable me to work next week. Yesterday (Christmas Eve) was a horrible day. As I wrote in my last post, I have been dealing with one of the side effects of Oxycodone: Constipation. I had not “gone” in 3 days. I felt bloated and in no mood to eat more. My top priority was to get things moving along. 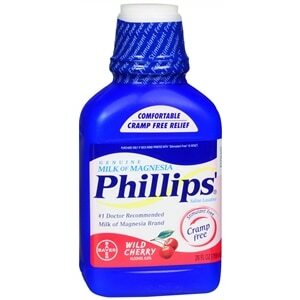 Jen went to the store and got me some Milk of Magnesia. I took the minimum adult dose: 2 tbsp and 8 oz of water. The label promises “results” anywhere from 30 minutes to 6 hours after dosage. My results were quite different. Within a half hour of taking the MOM, I started feeling sick to my stomach and had the beginnings of a headache. I took some Acetaminophen, but soon after, I was crawling to the toilet…not to poop, but to vomit. (At least it was cherry flavored I spent all afternoon sick and with a headache. It was as if I had food poisoning. My leg was the least of my worries. Afterward, it was suggested to me that maybe I should not have taken the Milk of Misery on an empty stomach. That may be true, but I am not willing to experiment with that stuff again. At this point, I’m just hoping that being off the Oxycodone alone will be enough to get my system moving again. We’ll see. As for my leg, I am essentially off all pain meds. I’m just taking 1 baby aspirin per day to reduce the chance of blood clots. In the middle of the night my leg started twitching, and it hurt a little. So, I took a couple of Acetaminophen. It is now 3 days after surgery to fix my ATR. The hiccups have stopped, and I’ve gradually reduced my pain meds. As I wrote last time, my plan was to gradually increase the time between dosages until I ran out of pills. 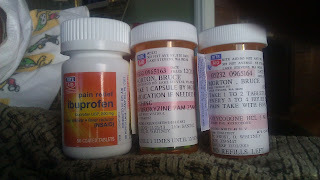 I started out at 2 pills (Oxycodone) every 4 hours, then 1 pill every 2 hours, and I got down to 1 pill every 3 hours. I was doing pretty good setting a timer every time I took a pill, but last night I forgot to set the timer. By the time I realized it, I had gone over 5 hours without taking meds. I quickly took one pill, but then realized that I wasn’t in any pain. So, I’ve decided to stop using the Oxycodone and Hydroxyzine. I’ve switched over to Acetaminophen instead. Commentors to my last post told me that I am lucky that I’m not in more pain. I do feel very blessed. I’m glad to be off the Oxycodone mainly because of its digestive effects. I haven’t pooped in 72 hours. I’m clogged up. So, my wife is heading to the store to get something for me. I’m continuing to do stretches, but the cast prevents me from moving more than I could. I suspect they’ll put me in a different cast or boot soon. Walking around with crutches is no fun and I can feel the blood rush throbbing within a few minutes. I came home yesterday and so far everything is fine. I’ve kept my leg up. I’ve gotten up and moved around, stretched, and started taking my prescribed meds. I was given a prescription for Oxycodone (5 mg) and Hydoxyzine (25 mg). Every 4 hours I am supposed to take 2 Oxycodone and 1 Hydoxyzine. I was also told to take Ibuprofin as needed to keep inflammation down. Like I wrote earlier, I don’t like pain at all, but I don’t want to take any more than needed either. So, what I want to do is start out with the prescribed dose and gradually reduce it. I’ve been keeping track of every pill I take, noting the amount and time of day. After every dose, I set a countdown timer on my phone for the next dose. This has worked out very well…even for those doses I take in the middle of the night. The nerve block that the anesthesiologist put in from my knee down started to wear off at 6 am. 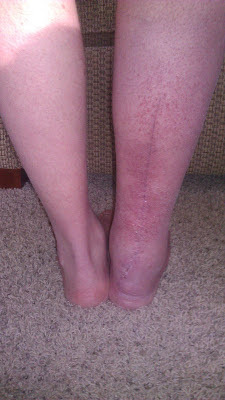 I could wiggle my toes 21 hours after the nerve block. Even though I have feeling in my leg now, I still have no pain. I can feel the stitches whenever I get up and move about. I have had one strange side effect since my surgery. I have had the hiccups for much of the time that I’ve been home. I don’t think it’s caused the prescription pills because the hiccups started before I took them. I can only attribute it to lingering effects of the general anesthesia or from the nerve block. I’m usually pretty good at stopping hiccups. I drink water, or just focus on relaxing the diaphragm. But the hiccups I have now won’t go away easily. At least they stop when I fall asleep. Back to the pills…Since I have no pain, I have begun to gradually lower my dosage. The first step has been to go from 2 Oxycodone every 4 hours, to 1 every 2 hours. Then I started spacing the time out to 2 hours 10 minutes, 2 hours 20 minutes, etc. So far, so good. It says to take the pills with food. I don’t eat every 2 hours, so I hope it’s not a problem to be taking the pills by themselves. I had my surgery today. Jen dropped me off way early for my appointment so that she could get Kelvin off to school. I was prepped up. 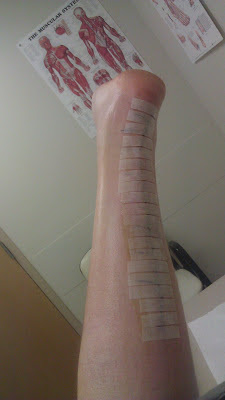 The nurses were very very nice to me, but they had a hard time finding a vein for the I/V. This desk jockey doesn’t have big muscular arms with veins popping out. It took 3 tries to get it in. When the young nurse couldn’t do it, she called the middle aged nurse, when she couldn’t do it, they called in the elderly nurse. For her, it was no problem. The surgeon explained what his plan was. Since I had a 9 cm retraction and a good amount of fraying of the tendon, he had to use a more extensive method to re-construct my tendon. 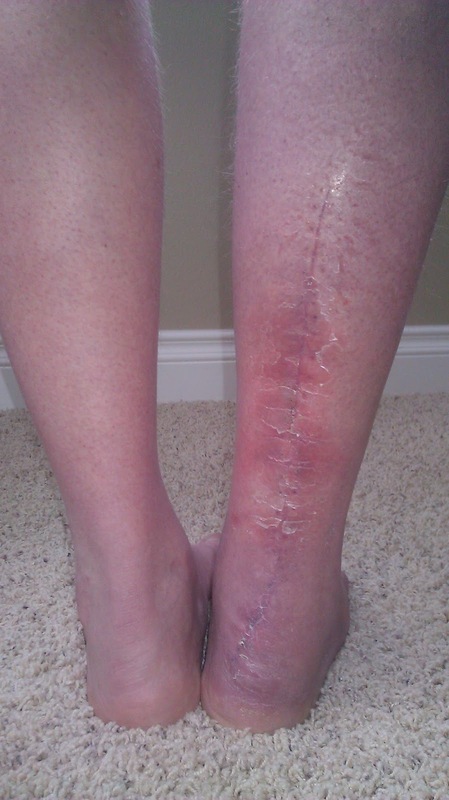 In addition to doing the typical stitching and joining of the tendon, he told me that he was going to make a larger incision and use part of my calf muscle in the procedure. 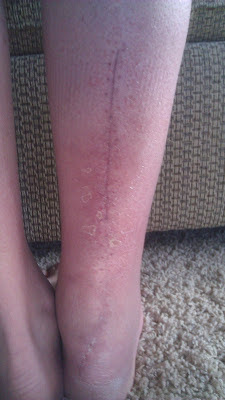 Basically, he cut away a flap from my lower calf muscle, flipped it down, and sewed it in with the newly joined tendon. Using that method, he’s able to use live tissue that is still getting blood flow and make the tendon much stronger. If he didn’t do that, there would still be some “give” in the stitching. I never read about this method in my research this week. It looks like a sound and innovative technique, but I’m afraid it will end up being more painful. It’s now 8 hours since my surgery. 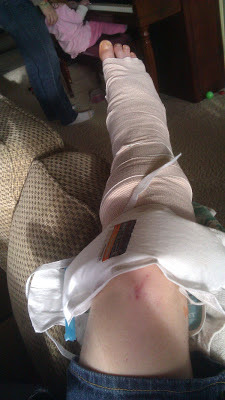 I had a nerve block given to me from the knee down. So, I still can’t feel a thing. I’ll start taking the pain meds in a couple of hours. I hate pain, so I will be following the prescribed regimen religiously. I’m using a countdown timer on my phone to remind me when to pop the next pill. I was also given general anesthesia. All I remember was when he put that mask on my face, next I knew, I was waking up in the recovery room. They must have dressed me in my street clothes while I was still under. Jen picked me up at noon. We went straight to the pharmacy. While waiting for her, I had to pee…bad! When she got back to the car, I went in to go to the bathroom. I’ve been peeing like crazy all afternoon. It must have been all the I/V fluids that they pumped into me. Getting home, I almost fell down the stairs, Jen had to catch me. I was laughing about it, but if she hadn’t gotten me it would have been real bad. My instructions are to start stretching and moving about right away. Going to the bathroom every hour and periodically straightening my leg is doing the job, I think. Alright, time to catch up on Falling Skies season 2!!! hurricane has completed the grueling 26.2 ATR miles to full recovery!